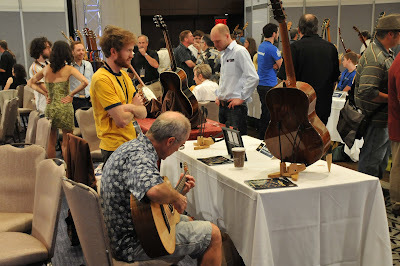 For the third year in a row I've been fortunate enough to display some of my work at the fantastic Montreal Guitar Show. It is a truly top-notch show and I also happen to live 10 minutes away. 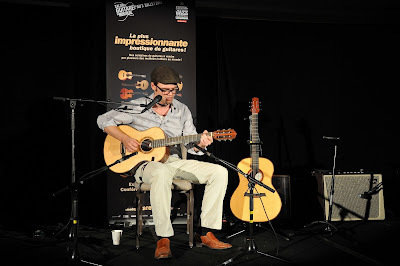 This means I not only had to spend less than $5 ($4.79 USD) in transportation costs, but Dion (dionguitars.ca) and I also got stay up working in the shop until 5 am the night before the show started. In this case, the ol' chestnut 'If it weren't for the last minute, nothing would get done.' didn't really apply. More fitting would be the new chestnut, 'If it weren't for punk rock christmas carols at 3:30 am, nothing would get done.' Let's just say it was a fun night. 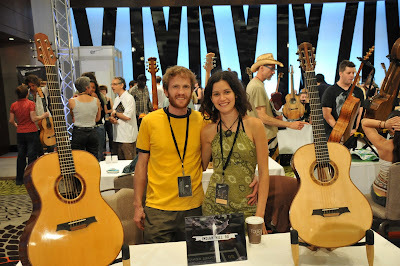 Fast forward a month and half and we then found ourselves at another world-class guitar show, this time in Santa Rosa, California at the Healdsburg Guitar Festival. I had been to Healdsburg once before while apprenticing with Sergei de Jonge, but this was my first chance to display my own work. All in all it was quite similar to the Montreal show, but being on the west coast meant a lot more ukuleles and a lot more guitar print Hawaiian shirts. I'd say that takes care of a good portion of the first G, so I think I'll leave it at that for now with more exciting installments, such as the great unbearding of 2011, on the way soon!